For other people by the same name, see James Harrison. James Henry Harrison Jr. (born May 4, 1978) is an American football linebacker for the Pittsburgh Steelers of the National Football League (NFL). He played college football for Kent State University, and was signed by the Steelers as an undrafted free agent in 2002. A five-time Pro Bowl selection, Harrison has earned two Super Bowl rings with the Steelers, in Super Bowl XL and Super Bowl XLIII. Harrison also played NFL Europe's Rhein Fire and had a brief stint with the Baltimore Ravens. He played 10 games for the Cincinnati Bengals in 2013. Soon after his season in 2013 with Cincinnati he stated that he would be retiring from the NFL, but he came out of retirement to return to the Steelers. Born in Akron, Ohio, Harrison was the youngest of 14 children to James Sr. (a chemical truck driver) and Mildred. He played Little League baseball in Scranton, Pennsylvania for Sloan Little League's Green Team. He was selected to the All-Star team in 1991. He grew up in Akron, and his favorite NFL team was the Cleveland Browns, who played only 40 miles from his house. His mother did not want him to play at first. It took both Harrison and his best friend from childhood, David Walker, to convince her. When he started to play, he excelled at both linebacker and running back. He attended two high schools his freshman year, Archbishop Hoban High School then Coventry High School, where, in addition to football, also participated in track & field, competing in events ranging from the shot put to the high jump. He had PR of 15.63 meters (51 ft 3in) in the shot put, 38.86 meters in the discus throw (127 ft 5 in) and 1.85 meters (6 ft 1 in) in the high jump. He was also a state-qualifier in the 4 × 100 m relay. Harrison was one of the first African-Americans to play football at Coventry, and he graduated in 1998. His high school football ability was great, but his lack of maturity at times was a struggle. Harrison did not pay attention to his grades or college entrance tests, and by his senior year he had become disruptive to his football team. Early in his senior year, Coventry staff had to suspend him for two games for challenging an assistant coach to a fight. After he returned from his suspension, in his next game, he began the game by carrying 3 times for nearly 100 yards and 2 touchdowns. After his second TD, he ran down the opposing team's sideline, and was ejected and later suspended for one game for making obscene gestures to the fans. Harrison was in court soon thereafter, after he shot a BB gun in the school locker room towards a defensive coach. He pleaded guilty to a minor charge and was able to return to school to finish his senior year. Due to his off-the-field issues, powerhouse football programs like Ohio State, Notre Dame, and Nebraska would rebuff their scholarship offers. Harrison attended Kent State University, and was a walk-on for the Kent State Golden Flashes football team. He became a starter in his junior season and led the team with 106 total tackles and 13 tackles for a loss. He also had an interception and three fumble recoveries. During his last collegiate game against Miami University, Harrison finished with 12 tackles, 5 sacks, and a forced fumble. At the end of the fourth quarter, he sacked future teammate, Ben Roethlisberger on third and fourth down to seal a 24-20 victory. In 2001, he recorded 98 total tackles, 20 tackles for loss, and led the MAC conference with 15 sacks, while also being voted to first-team Mid-American Conference. After graduating, he returned in 2010 to be inducted into Kent State's Varsity "K" Hall of Fame along with San Diego Chargers tight end, Antonio Gates. Harrison also made a donation of $100k to his alma matter, who in turn named the field house in his honor. In 2013, Kent State retired Harrison's jersey number 16. Harrison went undrafted in the 2002 NFL Draft, as teams feared he was too short (six feet) to play linebacker, and too light (240 pounds) to play on the defensive line. A few teams did send him training camp invites. The Steelers signed Harrison as an undrafted rookie in 2002, making him the first Kent State alumnus to play at linebacker for the team since Hall of Famer Jack Lambert. Harrison during Steelers Training Camp in 2008. Harrison spent two years on and off the practice squad for the Steelers, being released three times, and also was briefly on the active roster towards the end of the 2002 season, playing only special teams. Teammate and fellow linebacker, James Farrior, later told NFL Network that Harrison was so green early on in his career that he would simply "give up" on plays on which he was struggling and even would ask the coaches not to play him when he was struggling. Farrior said, "He was a knucklehead that didn't know the plays. We'd be in practice, in training camp, and he might not know what he was doing so he'd just stop and throw his hands up and tell (the coaches) to get him out of there. We thought the guy was crazy." Harrison wore number 93 during this period before adopting his current number 92, which at the time was worn by fellow linebacker and Pro Bowler Jason Gildon. He was signed by Baltimore in late 2003, then sent to the Rhein Fire of NFL Europe, but eventually was cut by the Ravens. After being cut for a fourth time, Harrison considered not playing anymore. Shortly thereafter, he was signed a fourth time by the Steelers during training camp in 2004 after Clark Haggans sustained an injury in an offseason weightlifting accident. Showing much improvement, Harrison made the final roster and remained with the Steelers through the 2012 season. Harrison later told the Beaver County Times that if not for Haggans's injury, he planned to retire from football at age 26 to focus on becoming a veterinarian, something that Harrison still plans on doing after his football career ends. Harrison also considered following in his father's footsteps to become a truck driver, and to this day does have a commercial driver's license. Throughout the 2004 season Harrison mostly played on special teams and on defense at linebacker, with occasional reps at defensive end. His first career start came against his hometown Cleveland Browns in Cleveland on November 14 after teammate Joey Porter and Browns running back William Green were ejected for fighting during the pregame warm-ups. Harrison had a good game statistically in the Steelers' 24–10 victory against their hated rival. Harrison scored his first career touchdown on a fumble recovery in the final week of the season against the Buffalo Bills. Harrison started in three games of the 2005 season when starting linebacker Clark Haggans was injured. His biggest highlight of the year was in a game against the San Diego Chargers, where he intercepted a Drew Brees pass for a 25-yard return. During the return, he made a huge leap over LaDainian Tomlinson, the Chargers star running back. Harrison gained some attention and popularity when he restrained a Cleveland Browns fan during a 41-0 Pittsburgh win on Christmas Eve. The intoxicated fan was on the field when Harrison grabbed the man and put him on the ground. Harrison restrained the fan until authorities took him away. The Steelers went on to win Super Bowl XL that season. Although Harrison was not a major factor in the game, he did play and earn a Super Bowl ring with the team, recording a team-high three special teams tackles. In the 2007 offseason, with longtime head coach Bill Cowher resigning after 15 seasons and Mike Tomlin taking over the reins, the Steelers controversially cut Joey Porter for salary cap reasons. Although the Steelers drafted two linebackers with their first two picks that year (Lawrence Timmons and LaMarr Woodley), Harrison was appointed the starter in place of Porter. The decision would ultimately pay off, as Harrison would go on to have a breakout season and earn his first trip to the Pro Bowl, making All-Pro as a starter on the AFC squad. On November 5, Harrison had a standout game on Monday Night Football against the Baltimore Ravens. He piled up 9 total tackles, 3.5 sacks, 3 forced fumbles, 1 fumble recovery, and 1 interception. The most memorable moment of the game, however, was Harrison's tackle of Baltimore safety Ed Reed. After a Steelers punt by Daniel Sepulveda, Reed had recovered the kick and was looking to return it. As Reed ran up the sidelines, he was blindsided by Harrison and the ball was knocked away from Reed's grasp. Pittsburgh linebacker Lawrence Timmons immediately recovered the fumble. The Steelers would go on to blow out the Ravens, 38-7. On November 26, during a Monday Night Football game, an announcer gave Harrison the nickname, "Mr. Monday Night", because of his outstanding performance on November 5. He piled up 8.5 sacks, 7 forced fumbles, 3 recovered fumbles, and 98 tackles on the year. He was voted team MVP for the 2007 season. In the Steelers Week 4 Monday Night Football game against the Baltimore Ravens Harrison recorded 10 total tackles, 2.5 sacks, 2 tackles for a loss, and a forced fumble. Along with LaMarr Woodley, who by this point was a starter in his own right, after the team chose not to re-sign Clark Haggans the previous offseason, Harrison and Woodley had become arguably the team's best pass-rushing duo since Greg Lloyd and Kevin Greene in 1994. Harrison amassed 16 sacks, breaking the team record set by Mike Merriweather in 1984. The two teammates set a team record with 27½ sacks. Harrison (92) lining up to play the Baltimore Ravens in 2008. Harrison also played special teams on a regular basis, making him one of the few regular NFL starters to also play special teams. His most notable special teams play for 2008, however, arguably cost the Steelers their game against the New York Giants in Week 8. With the Steelers leading 14-12 in the fourth quarter and having to punt from their own end zone, Harrison played as long snapper after regular long snapper Greg Warren suffered a season-ending knee injury earlier in the game. Harrison inadvertently snapped it over Mitch Berger's head for a safety, tying the score. On January 5, 2009, Harrison was named the AP NFL Defensive Player of the Year for the 2008 season, beating out Cowboys linebacker DeMarcus Ware for the award. Harrison became the first undrafted player to win the award. During Super Bowl XLIII, Harrison intercepted a pass from Cardinals quarterback Kurt Warner at the goal line and ran back the length of the field for a 100-yard touchdown at the end of the first half. In a memorable scene, Harrison collapsed in the endzone and spent several minutes regaining his breath as his teammates celebrated. It was the longest play in Super Bowl history (surpassing Desmond Howard's 99-yard kickoff return in Super Bowl XXXI, being broken by Jacoby Jones in 2013 with a 108-yard kickoff return) and helped the Steelers defeat the Arizona Cardinals 27-23. It was also the longest interception return in Steelers franchise history, surpassing the 99-yard return by Martin "Butch" Kottler which occurred in the club's second ever game and was the oldest team record on the books. Before the game, Gregg Easterbrook (author of Tuesday Morning Quarterback from Page 2 on ESPN.com) named Harrison the 2008 Tuesday Morning Quarterback Non-QB Non-RB NFL MVP. When receiving the trophy for the award, Harrison said he never even heard of the award. The week before, Easterbrook named Harrison to his annual All-Unwanted All-Pros due to his struggles earlier in his career of having been cut four times, three by the Steelers. On February 7, 2009, Harrison was parodied on Saturday Night Live's Weekend Update by cast member Kenan Thompson. Here Thompson depicts Harrison as being seemingly still out of breath and exhausted after his 100-yard interception return in the Super Bowl the week before. On April 13, 2009, it was reported that Harrison gained a 6-year, $51.75 million contract extension with the Steelers. In four games in October Harrison had 7.0 sacks, 25 tackles, two forced fumbles and a fumble recovery. He earned AFC defensive player of the month honors for October. Harrison ended the Season with 79 tackles, 60 of them being solo, and 10 sacks. This outstanding performance made him a starter in the Pro Bowl that year. Although Heath Miller, LaMarr Woodley, and Casey Hampton were named pro-bowlers as well, Harrison was the only starter from his team. Harrison's 2010 season was marred by committing several penalties and fouls. He was fined for the hits that were deemed to be illegal by referees and the NFL. In Week 2, Harrison was fined for flipping Vince Young of the Titans. On October 17, he knocked out two Browns wide receivers; Mohammed Massaquoi, and his former college teammate, Josh Cribbs. On Halloween against the Saints, he hit quarterback Drew Brees late from behind. Against the Raiders, he hit another QB, Jason Campbell. The following week at Buffalo, another incident occurred when Ryan Fitzpatrick had thrown a complete pass to David Nelson, Harrison came out of the line and speared Fitzpatrick. Harrison was fined an estimated $120,000 in total. In 2010 Harrison logged 100 tackles total, 70 solo tackles, 10.5 sacks, 2 interceptions and 6 forced fumbles. Harrison would help the Steelers reach the Super Bowl for the third time in six years. In Super Bowl XLV, Harrison recorded a sack on Aaron Rodgers, but lost 31-25 to the Green Bay Packers. In 2011 Harrison recorded 59 tackles and nine sacks in 11 games. In 2012 he had six sacks and 70 tackles. On March 9, 2013, Harrison was released by the Pittsburgh Steelers for salary cap reasons after they could not agree on a pay cut. Harrison signed with the Cincinnati Bengals on April 23, 2013. He recorded 30 total tackles (16 solo), 2 sacks and an interception in limited playing time. On March 13, 2014, he was released by the Bengals. Harrison announced his retirement on August 30, 2014 and officially retired as a member of the Pittsburgh Steelers on September 5, 2014. On September 23, 2014, rumors surfaced that Harrison was set to return to the NFL after Mike Tomlin noted in a press conference that there were significant injuries suffered by members of the Steelers defense. The Steelers posted a message on their Twitter page announcing that Harrison will return to the Steelers. Harrison officially signed with the Pittsburgh Steelers on September 23, 2014. He recorded 45 tackles and 5.5 sacks in 11 games. On March 22, 2015 Harrison signed a two-year extension with Pittsburgh for $2.65 million and a $500k signing bonus. On February 17, 2016, James Harrison announced that he is returning for a 14th season with the team. On November 20, 2016, James Harrison surpassed Jason Gildon to become the Steelers' all-time sack leader with 77.5, during a 24-9 win over the Cleveland Browns. As well as being nicknamed "Silverback", Harrison's teammates also call him Deebo, after the character from the Friday movies. 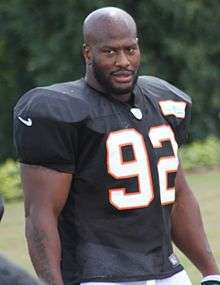 He has two children, James Harrison III, born in 2007, and Henry, born in 2009. Harrison elected not to visit the White House with the rest of the team after the Steelers won Super Bowl XLIII. Skipping the visit gained some media attention, as Harrison said that Barack Obama (who supported the Steelers in the game and considers his second favorite NFL team after his hometown team, Chicago Bears) would have invited the Arizona Cardinals had they won: "This is how I feel — if you want to see the Pittsburgh Steelers, invite us when we don't win the Super Bowl. As far as I'm concerned, he [Obama] would've invited Arizona if they had won." Harrison had also skipped the team's visit after winning Super Bowl XL when George W. Bush was president. Harrison was arrested in March 2008 and was charged with simple assault and criminal mischief stemming from a domestic altercation with his girlfriend, Beth Tibbott. On April 3, 2008, the district attorney dropped all charges because Harrison had completed anger management counseling and psychological counseling. The arrest gained some controversy after the team released wide receiver Cedrick Wilson in a similar, but unrelated, incident around the same time but did not release Harrison. The Steelers even issued a press release shortly after they released Wilson stating that Harrison's incident and Wilson's incident were examined "on a case-by-case basis" and Wilson's incident determined that his warranted release while Harrison had "taken responsibility for his actions." Steelers owner Dan Rooney, a lifelong devout Catholic, added that the incident was concerning their son's baptism, that Harrison's girlfriend reportedly did not want their son baptized, and that Harrison promptly called the Rooney family about the incident. Nonetheless, there were still accusations of a double standard because of the timing of both Harrison's and Wilson's incidents. The NFL, which had been cracking down on off-the-field conduct, took no action in either incident. On May 23, 2009, Harrison's son, James III, sustained an injury to his thigh when the family's pit bull became agitated and bit him. The boy's mother, Beth Tibbott, who had let the dog out of his cage, was also bitten when she tried to intervene. The dog also bit the player's massage therapist, who needed three stitches. Harrison's agent, William Parise, said the boy's injuries were "serious but certainly not life-threatening." Three days later, James III was released from the hospital. The pit bull was scheduled to be euthanized but through the team, Harrison was able to place the dog in a temporary home that specializes in training aggressive dogs to be gentle. On July 13, 2011, a controversial magazine article titled "James Harrison: Confessions of an NFL Hitman" was published by Paul Solotaroff in Men's Journal. In the article, Harrison was asked multiple questions about who he is and why he plays the game of football the way he does. The controversy comes into play when Harrison begins talking about the NFL commissioner Roger Goodell. Harrison called Goodell a "crook and a puppet", and then proceeded to say that "I hate him and will never respect him." Harrison also made comments towards his quarterback, Ben Roethlisberger, and other players in the National Football League such as Brian Cushing. Harrison released an apology for his statements on July 14, 2011. 1 2 Merrill, Elizabeth (2009-01-25). "Harrison gives Steelers 'scary' presence". ESPN.com. ↑ Biography Today. Detroit, Michigan: Omnigraphics. 2009. p. 72. ISBN 978-0-7808-1052-5. 1 2 3 Elizabeth Merrill (2009-01-29). 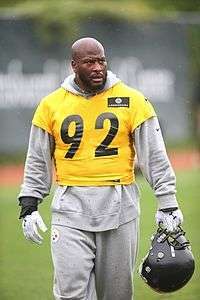 "Pittsburgh Steelers linebacker James Harrison's glare tells only half the story". ESPN. Retrieved 2012-08-17. ↑ "NFL - Baltimore Ravens/Pittsburgh Steelers Box Score Monday November 5, 2007 - Yahoo! Sports". Sports.yahoo.com. Retrieved 2012-08-17. 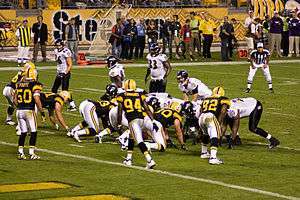 ↑ "NFL Game Center: Baltimore Ravens at Pittsburgh Steelers - 2008 Week 4". Nfl.com. Retrieved 2012-08-17. ↑ Judge, Clark (2008-11-19). "D MVP candidates Awesome Albert has plenty of company – NFL – CBSSports.com News, Rumors, Scores, Stats, Fantasy". Sportsline.com. Retrieved 2012-08-17. ↑ "Pittsburgh Steelers | News". News.steelers.com. Retrieved 2012-08-17. ↑ Archived October 28, 2008, at the Wayback Machine. ↑ "Real Insight. Real Fans. Real Conversations". Sporting News. Retrieved 2012-08-17. ↑ Schwarz, Alan (February 2, 2009). "Big Play by Steelers' Harrison Took His (and Others') Breath Away". The New York Times. Retrieved May 5, 2010. ↑ O'Brien, Jim (August 29, 1982). "Original Steelers (Pirates) Happy to Be 'Home'". Pittsburgh Press. p. D-2. Retrieved May 12, 2011. ↑ Gregg Easterbrook Special to Page 2 (Archive) (2009-02-03). "Gregg Easterbrook: A fascinating Super Bowl, from start to finish – ESPN Page 2". Sports.espn.go.com. Retrieved 2012-08-17. ↑ Join the discussion: Click to view comments, add yours. "Pittsburgh Steelers update – Tampa Bay Times". Tampabay.com. Retrieved 2012-08-17. ↑ Gregg Easterbrook Special to Page 2 (Archive) (2009-01-29). "Gregg Easterbrook: A Super Bowl prediction and Unwanted All-Pros – ESPN Page 2". Sports.espn.go.com. Retrieved 2012-08-17. ↑ Archived May 1, 2009, at the Wayback Machine. ↑ "Harrison wins player of the month". News.steelers.com. Retrieved 2012-08-17. ↑ "Steelers LB James Harrison fined for slamming Titans QB Vince Young – NFL News | FOX Sports on MSN". Msn.foxsports.com. 2010-09-22. Retrieved 2012-08-17. ↑ Hensley, Jamison (March 9, 2013). "Steelers release James Harrison". ESPN.com. Retrieved 2013-03-09. ↑ Brown, Scott (March 22, 2015). "Steelers re-sign LB James Harrison". ESPN.com. Retrieved 2015-03-22. ↑ "James Harrison Stats". ESPN Internet Ventures. Retrieved 31 March 2014. ↑ McSmash, Steely (2008-09-06). "Before We Get This Party Started, One Last BTSC Steelers Chat With Jim Wexell". Behind the Steel Curtain. Retrieved 2012-08-17. ↑ Chase, Chris. "Mr. Harrison isn't going to Washington; Steeler spurns Obama – Shutdown Corner – NFL Blog – Yahoo! Sports". Sports.yahoo.com. Retrieved 2012-08-17. ↑ "Pittsburgh Steelers Linebacker James Harrison Arrested". www.wpxi.com. Retrieved 2012-08-17. ↑ McKinnon, Jim (April 3, 2008). "Assault charge dropped against Steeler James Harrison". Pittsburgh Post-Gazette. ↑ "Pittsburgh Steelers | News". News.steelers.com. Archived from the original on April 25, 2010. Retrieved 2012-08-17. ↑ "Pittsburgh Precedent: Steelers Release Cedrick Wilson, Keep James Harrison". Bleacher Report. 2008-03-21. Retrieved 2012-08-17. ↑ Archived July 29, 2014, at the Wayback Machine. ↑ "Rooney: Steelers released Cedrick Wilson because of arrest". WSLS 10. Associated Press. 2008-03-20. Archived from the original on July 19, 2008. Retrieved 2012-08-17. ↑ MJD. "Ben Roethlisberger could murder a dozen infants and be just fine – Shutdown Corner – NFL Blog – Yahoo! Sports". Sports.yahoo.com. Retrieved 2012-08-17. ↑ "Two-year-old son of Steelers LB Harrison released from hospital". Nfl.com. 2009-05-27. Retrieved 2012-08-17. ↑ "Pet Tales: Dog trainer says Patron was worth the second chance". Pittsburgh Post-Gazette. June 20, 2009. ↑ Solotaroff, Paul. "Confessions of an NFL Hitman". Mens Journal. Retrieved 2012-08-17. ↑ "James Harrison Apologizes For Article, Says 'I Am Not A Homophobic Bigot'". SBNation.com. 2011-07-14. Retrieved 2012-08-17.